I need to start off this review of the Onda V701s quad-core Android tablet by making a few clarifications. First of all, the Onda V701s seems to be identical to the Onda V711s. By comparing photos and specifications, both models are identical as far as I can tell. I do not know why Onda has 2 different model numbers for what seem like identical products. Since, the unit I am reviewing has the Onda V701s marking on both the box and the tablet PC itself, I am referring to it as such. Secondly, there is an older version of the Onda V701s that does not have the “s” suffix. This older version is a dual-core version with an Amlogic AML8726-MX SoC. The newer Onda V701s on the other hand, is powered by an Allwinner A31s quad-core ARM Cortex-A7 with a PowerVR SGX544MP2 GPU. Now that we have established which Onda V701s Android tablet that I am reviewing here, we can now proceed with the actual review. AliExpress has numerous retailers that are offering the Onda V701s at a great price and some even have free international shipping thrown in. The Onda V701s’ biggest selling point and it is non-discreetly plastered all over the box is that it is the thinnest and lightest 7 inch Android tablet. I do not know if it is actually the thinnest but the 7.4 mm thickness is very thin and it is the thinnest Chinese branded tablet that I have come across so far. The Onda V701s has an aluminum body that makes it possible for it to have such a svelte body dimension. 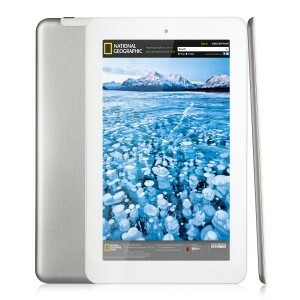 The metal construction also gives the tablet a classy look the belies its budget price tag. The Onda V701s’ feather light 280g does make the tablet very comfortable to hold for a long period of time. The 7 inch frame is just nice for holding single handedly. The full dimensions for the tablet are 192 x 122 x 7.4 mm. On the right side of the tablet are the power button, a micro USB port, microphone, a mini HDMI port, 3.5mm audio jack and also a physical home button. Having the power button and home button on both ends can be rather confusing. I always ended up switching off the power unintentionally. In the end, I decided the just use the soft home button as it is not such a hassle to hit the home button instead of the power button. There is no physical volume button. I would rather have a volume button instead of a home button as it is quite troublesome to use the soft volume buttons on the menu bar. When I am watching videos, the menu bar is often hidden. The Onda V701s has a microSD slot at the top edge and also a single speaker on the left side of the tablet. How does the Onda V701s compare with other tablets? The Onda V701s is the first budget range tablet that I have come across that has an Allwinner A31s quad-core SoC. All the other budget tablets either have a dual-core chipset or a Actions ATM7029 quad-core SoC. While the ATM7029 is classified as a quad-core chipset, its performance is similar or at times worse than dual-core chipsets like the RK3066. It is also interesting to note that the A31s in the Onda V701s is a new chipset from Allwinner. It is very similar to the A31. Both chipsets have quad-core Cortex-A7 CPU paired with a PowerVR SGX544 GPU. However, the A31s is specifically designed for the “phablet” market – the category that straddles between smartphones and tablets. However, since the Onda V701s does not have any phone functions, it is puzzling why Onda decided to go for the A31s instead of the A31. The tablet comes with a 7 inch 1024 x 600 pixel resolution IPS display. The display on the V701s is not awesome but it is rather good. It has great color contrast and an almost 180 degree viewing angle. However, like most IPS displays, visibility in direct sunlight is poor as the screen gets washed out. The Onda V701s comes equipped with 1 GB DDR3 RAM and for storage it has 8 GB of NAND Flash. I would also like to highlight here that I have come across retailers who list the RAM as 512 MB. I am not sure if this is a typo or if Onda releases different versions with different RAM. I am not surprised if it is the latter as this is a common occurrence among China tablet PC manufacturers. On the front of the tablet is a 0.3 MP camera mainly used for video calls. There is no rear facing camera. The tablet has a 3700 mAh capacity battery that is rated for 3 to 4 hours of use. The Onda V701s has a pretty powerful Allwinner A31s quad-core chipset that is powering a relatively low resolution 1024 x 600 display. The A31 which is in the same class as the A31s is being used on tablets with retina displays with resolutions up to 2048 x 1536, more than 4 times the number of pixels to push. With a lower resolution, the A31s is more than adequate for the V701s. The device had no problems with video playback. It could nimbly play almost all the video files I tried on it except for a particular HD mp4 file that seems to give trouble to almost all Android devices but plays fine on a PC. YouTube and Netflix worked fine on the V701s and it has support for full screen playback. I also tried outputting the video to a full HD 1080p display using the HDMI connection on the tablet. No problems here as well. The V701s is capable of decoding 2K videos as well. I tried playing back a couple of sample videos and it looks fine but I don’t have a Ultra HD display to test out the full resolution quality. As an further display of the A31s’ video decoding capabilities, you can play up to 4 different video files at the same time in floating windows. Looks cool but ultimately not a very practical feature. The V701s impressive performance extends to web browsing. With a fast internet connection, everything loads fast on the Chrome browser. The tablet performs fairly well with multi-tabbed browsing as well but begins to show its limits if too many tabs are loaded at the same time. This is more of a limitation of the included 1GB RAM rather than the Allwinner chipset. Gamers should be fairly happy with the Onda V701s’ gaming performance. It handles both casual games and pretty intensive 3D games a lot better than I expected with a budget tablet. The Allwinner A31 has proven to be quite a capable chip when it comes to 3D gaming. It scored well on graphical benchmarks. The 7 inch 1024 x 600 IPS display looks good. It is sufficiently bright with nice color contrast and saturation. However, I had slight problems with the touch sensitivity of the capacitive screen. Sometimes my touch inputs are not detected properly and requires a firmer press on the screen to get it acknowledged. WiFi performance could have been better. I suspect the aluminum case might have caused a little interference with the WiFi reception. As with most China tablets, the VGA 0.3MP front facing camera is nothing much to shout about. All that I can say about it is that it works with video conferencing apps like Skype. The 3700 mAh battery is able to keep the Onda V701s going for about almost 3 hours with heavy use. Screen brightness was kept at maximum, WiFi turned on and the tablet was used for 3D gaming and HD video playback continuously. Under light use conditions with sporadic WiFi and screen brightness at half, the battery lasted almost 4 hours. This is in line with the manufacturer’s rated 3-4 hours battery life. The V701s’ battery is charged via its USB port so you can easily use an external 2A rated USB battery charger to extend the battery a little longer while on the move. For a budget-priced 7 inch tablet that is priced at under $100, the Onda V701s is a steal. It has a very capable quad-core Allwinner A31s SoC. The A31s works great when paired with a 1024 x 600 display. It would have been better if the display resolution is a little higher at 1280 x 800 like the one on the Ainol Novo 7 Flame, another budget-priced 7 inch tablet. However, the Flame has a much inferior dual-core AML8726-M6. Between the 2 options, I’ll pick the A31s with the lower resolution display for better performance overall. Although it doesn’t factor a lot into my verdict for the V701s, this tablet is supposedly the thinnest and lightest 7 inch tablet. The problem with such claims is that even if they are true, the record don’t last for long as someone will come up with a tablet that is 0.1mm thinner and 1g lighter to claim the crown. What does matter is that the V701s is indeed comfortable to hold and feels good in my grip. Overall, the V701s is quite a well rounded device that should please most users. The only notable problems I had with it are the sensitivity of the touch display and the slightly below average WiFi reception. Considering the price of the Onda V701s, I am willing to overlook them and give the tablet a full 5 stars. The Onda V701s also gets my vote for the best budget 7 inch tablet. my tablet don’t work with 3d games, it always bug after many lag. Have you encountered this problem ? I have to admit that I didn’t try many 3D games on the V701s but those that I tried worked fairly well. As far as I know, they are both identical. I couldn’t find any information that proves otherwise. Re: the RAM, I was also confused with its capacity. Even Onda’s web site review discusses the incongruities and says it’s only 512. For That reason I’m not going to purchase it.